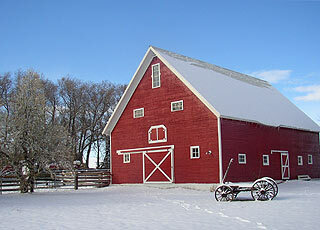 Enjoy the Lazy B Barn for your wedding, company party, or convention in Montana. Located only 15 minutes from the airport, and 10 minutes from Bozeman, MT it is easy access for all who attend. We enjoy 360 degrees of mountain views that overlook Bozeman and the Gallatin Valley, and you will love the country feel of the Lazy B Farm. The Lazy B Barn is over 100 years old, has 2 levels for your events, and has been restored inside and out. It has heating for winter events, and reflects our western heritage beautifully. From its authentic wooden nails to the horse stalls on the main floor, your event will have a comfortable country feel with the convenience of a modern facility. Treat your employees to something special for your company party and have a hay ride with Tom & Jerry, our Clydesdale horses. Whether you'd like an indoor or outdoor wedding in Montana, the Lazy B Barn is a great rustic location to make your wedding something special. Have your bride delivered in a white carriage and finish the day with your reception in the barn.